How this movie slipped through the cracks boggles my mind. The Iceman is the story of real life hitman/serial killer Richard Kuklinski who killed over one hundred people between 1964 and his arrest in 1986. 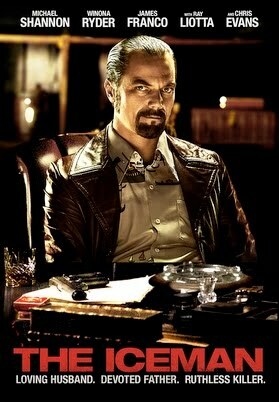 He is expertly portrayed by Michael Shannon who turns in another great cold and offbeat performance. Shannon has emerged as one of our most unique and reliable actors of the past decade. It’s a shame that The Iceman features one of his best performances and so few people have probably seen it. It also features unexpectedly surprising turns from Ray Liotta, Winona Rider, Chris Evans (Capt. America is actually playing a contract killer who is in competition with Shannon’s Kuklinski until they join forces), Stephen Dorff and James Franco. One is never truly sure what to expect when a movie disappears this quickly from cinemas and from the public conscience and appears on Netflix, but The Iceman is a buried treasure that should be discovered. The early scenes with Michael Shannon as the title character are very effective as we see him kill people in such a cold matter of fact manner that the “Iceman” name he receives is extremely fitting. But then as the movie progresses and Kuklinski eventually marries his wife (Winona Rider, her best acting in years) and has two daughters, Michael Shannon still plays him very cold and detached but there is a certain amount of tenderness we see beneath his eyes as he slowly becomes more attached to his family and does not want to hurt them and let them know about his job and his true nature. The Iceman is currently available for streaming on Netflix. Watch the trailer below. Thanks for recommending The Iceman. You are right, it did slip through the cracks. I watched the trailer and it looks great… true story, the cast. Can’t wait to watch it!